FILE - A China yuan note is seen in this illustration, May 31, 2017. 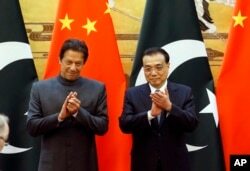 China has agreed to carry out bilateral trade with Pakistan in the Chinese yuan instead of the U.S. dollar to help ease the South Asian ally's financial and economic woes. "The agreement is part of practical steps being taken [by China] to support our [foreign] currency [reserves],” said Pakistani Information Minister Fawad Chaudhry. Pakistani Prime Minister Imran Khan, left, and China's Premier Li Keqiang attend a signing ceremony at the Great Hall of the People in Beijing, Nov. 3, 2018. 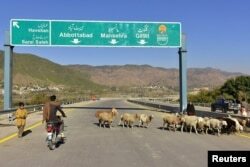 FILE - A Pakistani motorcyclist drives on a newly built Pakistan China Silk Road in Haripur, Pakistan, Dec. 22, 2017.